Fertilizing your lawn regularly can help reduce weeds and create a lush, green appearance. If you're new to lawn care, or just new to fertilizing, you may be looking for a lawn fertilizer chart to help you keep track of what to put on your yard when. There are so many differing opinions on the best products to use and how much to apply that it can get very confusing. That's where charts and expert advice can come in handy. Lawn care may sound simple, but the cost of fertilizer, grass seeds and other treatments can quickly add up. 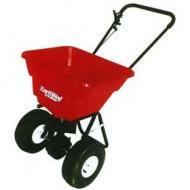 Lawn fertilizer charts can help you figure out fairly accurately how much product you need. Without a lawn fertilizer chart, you can easily put too much product on your lawn and overbuy. Usually, it is recommended that you apply a pound of nitrogen for every 1,000 square feet of lawn. Most experts believe that grass grows the best with a fertilization ratio of one portion phosphorous, two portions of potassium and three portions nitrogen. However, the acidity of your soil and other conditions may change this ratio slightly. Most universities have a local garden extension office, or you'll find a local county cooperative. They will be able to provide help with soil testing and proper ratios. Otherwise, any good lawn and garden center will help you with this information and finding the perfect fertilizer for your lawn. 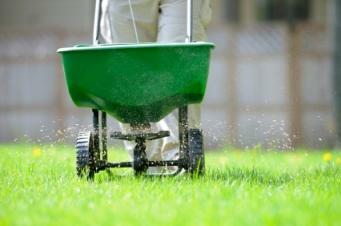 Many landscape suppliers will even help you map out a schedule of when to fertilizer your lawn. The amount of nitrogen in fertilizer varies, depending upon the type of fertilizer you purchase. Oklahoma State University - In addition to a detailed chart listing how much fertilizer to apply, this guide talks about mulching, when to mow and how to use grass clippings. Seedland - In addition to offering generic formulas for the best fertilization ratios, you'll find nitrogen rates and you'll also find formulas to help you calculate how much product you'll need to complete the job. Lawn Math - A user-friendly site that makes understanding the math of lawn care simple. Fertilizing Lawns - In addition to fertilizing charts, this site offers a complete list of everything your yard needs to thrive in different weather conditions, including how much water and other nutrients. Liquid Lawn Fertilizers - Thinking about using a liquid lawn fertilizer instead of the typical dry fertilizer? You'll want to read this insightful article about the differences between the two and how to apply liquid fertilizer for the best results. Scott's - A well-known name in lawn fertilizers, Scott's offers many different tips and techniques through their website as well as information related to specific products. They offer a complete learning library to help anyone have a green thumb. The All Seeing All Knowing Lawn Care Manual - This PDF chart goes into much more than just the fertilization part of lawn care. You can even look up specific problems you might be having with your lawn, such as compacted soil. You'll find lawn fertilizer charts, watering schedules and special care for different types of grass seeds and lawn types. Whatever lawn fertilizer you ultimately decide to use on your yard, you'll need to keep up a regular lawn maintenance schedule to keep your grass looking its best season after season. Be careful not to mow your grass too short to avoid killing off your new lush, green lawn. When in doubt, contact your local county extension office or other professionals for a second or even a third opinion.